Getting consumers to try live TV streaming services (like Hulu with Live TV, Sling, DirecTV Now and YouTube TV) isn’t easy. All of them offer their service free before the meter starts. That gives viewers a chance to get familiar with watching familiar TV in an unfamiliar way, usually for a cost-free week. The week-long time frame makes some people think: This would be a good time to try out a live TV streaming service. The World Series begins tonight on Fox — and with an experimental subscription, a viewer could see five of the possible seven games for free. After that the resourceful customer would have to find a new way to see the remaining games..
One way would be to test a second one of the live TV streamers. Sling, for one, is “reminding” consumers this is the perfect time to try it out. Freed from cable and satellite contracts, though, consumers seem to enjoy coming and going at will. 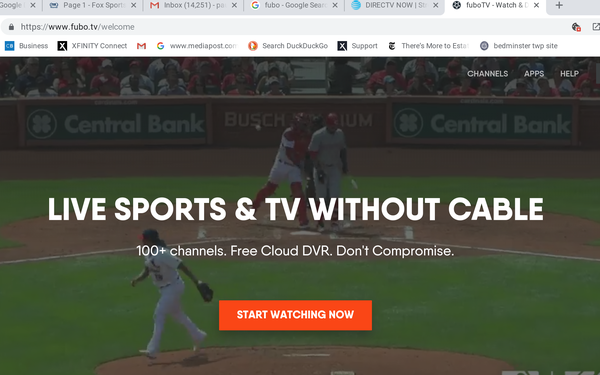 Using data from Q1 of 2018, Greeson says about half of active subscribers have used and canceled other services: 27% canceled Hulu with Live TV after the free trial, 36% got rid of YouTube TV, 21% voided Sling, 14% discontinued DirecTV Now, 13% zapped Playstation Vue, and 29% gave sports-tilted Fubo TV the boot. Still, that means quite a few stayed, at least for a while. Meanwhile, according to new data from TDG, people who have Roku streaming devices are most likely not to have a “legacy pay TV” service like cable or satellite.The data says 30% of Roku’s users cut the cable cord, higher by a few percentage points than others like Amazon or Apple. “For many TV streamers, buying a Roku, and getting access to the Roku video ecosystem, is no longer just an easy way to supplement their legacy pay-TV service, but a means of replacing it," Greeson says.